Local Students and Restaurants Step Up for the Bays! Ocean View, DE – Local students and restaurants have started 2019 on the right foot! Representatives from Chesapeake & Maine, SoDel Concepts, C.A.P.E. 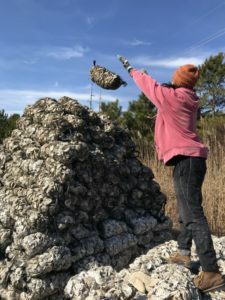 for Tomorrow, and Sussex Technical High School have spent their new year volunteering time and energy to prepare oyster shells that will be used to restore shorelines and reintroduce the American Oyster (Crassostrea virginica) to the waters of Delaware’s Inland Bays. On January 7th, Chesapeake & Maine bagged over 7.7 tons of spent oyster shell and on February 5th, SoDel Concepts (the parent company behind Bluecoast, Catch 54, Fish On) also bagged approximately 7.7 tons! Both of these restaurants are doing double duty as well: both bagging the shell and providing it as participating restaurants in the Center’s “Don’t Chuck Your Schucks” program. 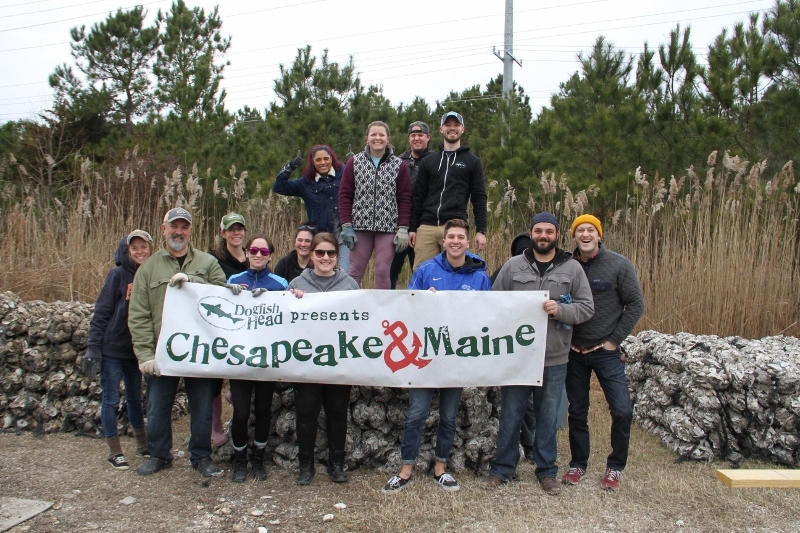 Volunteers from Chesapeake & Maine pose for a photo after a long day of work on January 7th. “Our oyster and clam shell recycling program was formalized in 2014 and now collects from over 20 local restaurants.” according to Bob Collins, Program Manager for the Center. “These restaurants are able to give back to their community in a unique way.” In 2018 alone, the program collected just under 4,000 bushels of empty shell! Local students have been involved in this effort too! C.A.P.E. for Tomorrow (a Cape Henlopen High School club that promotes compassion for animals and protecting the environment) joined the effort as well as students from Sussex Technical High School who traveled from Georgetown to bag shell as part of their Environmental Tech Area field trip on the topic of oyster recycling. Together, the school groups bagged an impressive 14 tons of shells! In addition to their volunteer labor, C.A.P.E for Tomorrow students graciously donated $200 to the Center from their winter fundraiser funds! Nate Linton from C.A.P.E. for Tomorrow tosses a completed bag on top of the ever-growing pile of bags destined for reforestation projects. The Don’t Chuck Your Shucks and shell bagging projects are two different steps in the same initiative. When you visit a participating restaurant and order oysters or clams, restaurant staff will separate your discarded shell into a shell specific receptacle. Once collected, the shell is allowed to “cure” in the sun for a minimum of six months and then bagged for use in bay-friendly restoration projects. One such project is the Read Avenue Living Shoreline planned for Dewey Beach. Moving forward, the Center will be hosting bagging events for local organizations and corporate groups. “This continued support allows us to install living shorelines (a technique of shoreline stabilization engineered using natural materials) and even create test oyster reefs to determine best tactics for enhancing native oyster populations in the Inland Bays,” says Center Project Manager, Victoria Spice. Posted in PRESS RELEASE | Comments Off on Local Students and Restaurants Step Up for the Bays! Ocean View, DE —This fall, volunteers from the Delaware Center for the Inland Bays, the Delaware Department of Natural Resources and Environmental Control (DNREC), and the Coastal Gardeners Club planted trees to improve wildlife habitat at the James Farm Ecological Preserve. Between 1992 to 2012, the Inland Bays watershed lost 14 miles square miles of forests. This vital habitat for wildlife has been largely replaced with developments, a change that also adds adds to roads and rooftops that contribute to stormwater runoff. This loss of forests also affects populations of wildlife that rely on them for nesting, feeding and breeding, including amphibians, turtles, wild turkeys — and native songbirds! 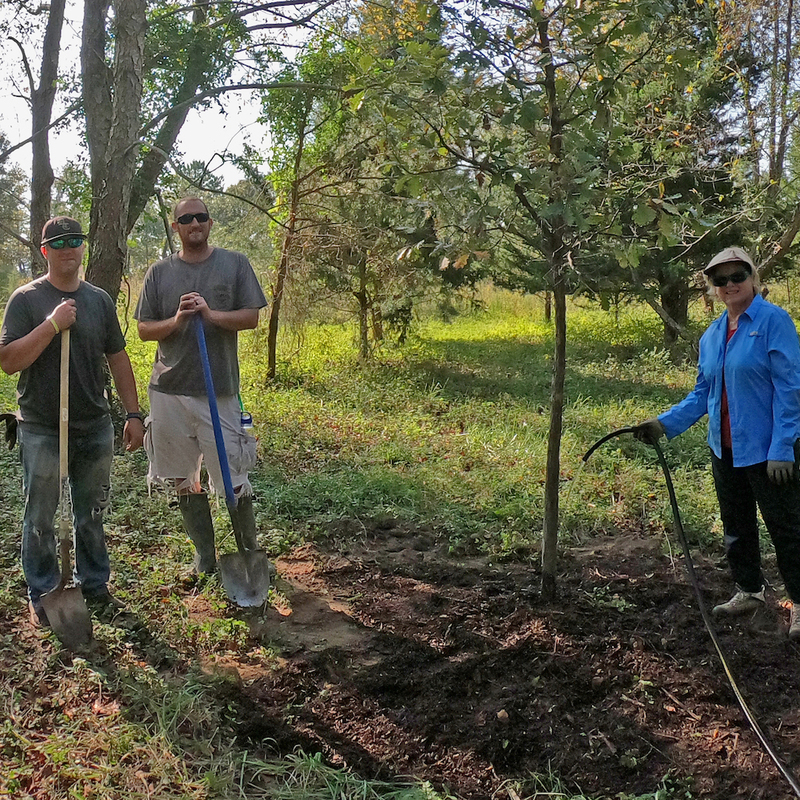 Twenty-two volunteers worked together to dig holes, move compost, mulch and plant fifteen-foot native hardwood trees to extend and improve the Preserve’s forest in what was once a pasture. In addition to diversifying the existing forest, this fuller canopy will also serve as a shaded picnic area for visitors to enjoy the Preserve. This improvement is part of Phase I of the James Farm Master Plan, a project expected to be completed by Spring 2019. Created in 2014, this Plan includes several Phases of updates that will help accommodate the growing needs of the Preserve, while protecting its natural resources and enhancing educational opportunities. Right now, the Center is working to raise funds for the second phase, including repair and realignment of the trail system, construction new educational facilities, and improvements to storage areas. For information about the James Farm Master Plan and how you can get involved, visit us online at www.inlandbays.org/JamesFarm. Funding for this planting project was provided by the Delaware Forest Service Urban and Community Forestry Program, whose goal is to enhance and promote the proper stewardship of Delaware’s urban forest resources. Sussex County, DE — An ordinance just passed by the Sussex County Council will protect the County’s tidal wetlands and tidal tributary streams by subtracting their acreage from a development’s buildable area. The previous trend of high-density development near these sensitive areas was putting people right in the path of floodwaters. Until now, the County’s calculation for a development’s “gross buildable area” has been calculated using the total acreage of a development site, even when this acreage includes unbuildable and ecologically-important areas like wetlands and streams. This practice has effectively concentrated dense development on areas too near the County’s most sensitive wetlands and waterways. The new ordinance, passed by the County Council on December 4, will calculate permitted density based on total acreage, unless that acreage includes a state tidal wetland or tidal tributary stream. In that case the total acreage will be determined by subtracting out the acreage of these newly protected areas. The ordinance was amended after the public hearing and council discussions, removing language that would have offered the same protections for perennial non-tidal rivers and streams, and non-tidal wetlands. 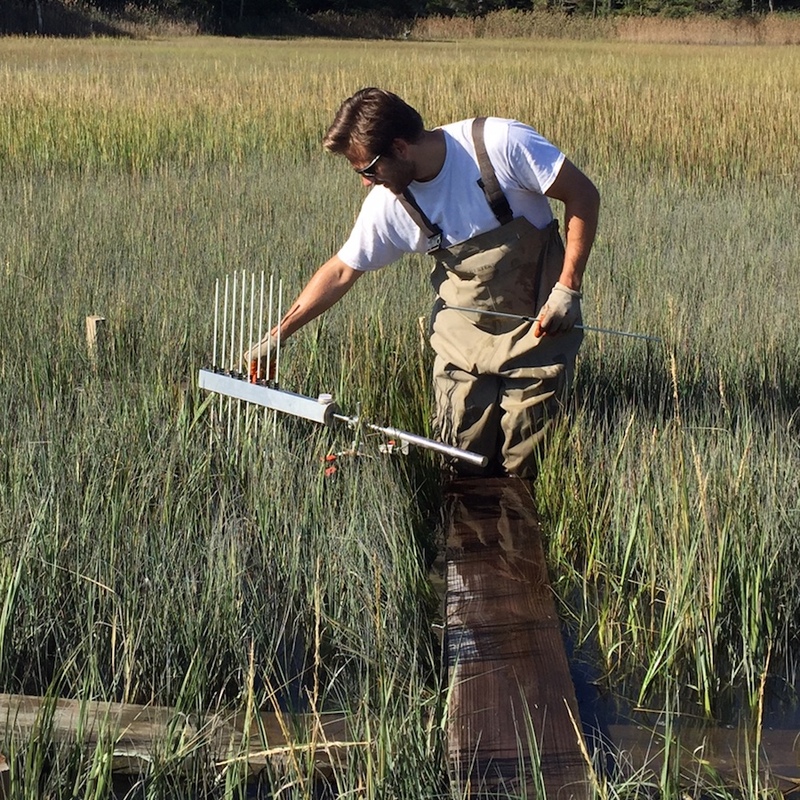 The Center conducts research on tidal wetlands. Here, Environmental Scientist Andrew McGowan is measuring elevation levels. Areas with high density development and impervious surfaces such as roads, parking lots, and rooftops, are more vulnerable to stormwater runoff (a source of pollutants to local waterways) and flooding from storms and sea level rise. The previous trend of high-density development near these sensitive areas was leaving community members right in the path of this flooding: putting their homes and lives at risk. With less dense development, the protected tidal wetlands can help mitigate flooding events, acting as sponges for rain, storm surge, and floodwaters. More information is available at https://sussexcountyde.gov/ordinance-relating-calculation-permitted-density. Ocean View, DE — On November 16, the Delaware Center for the Inland Bays broke ground to implement the James Farm Ecological Preserve Master Plan, a community-developed initiative designed to protect the Preserve’s diverse collection of ecosystems, while safely accommodating and educating a growing number of visitors. In 2014, the Delaware Center for the Inland Bays, which manages the Preserve for Sussex County, created a Master Plan that accommodates the growing needs of the Preserve, while protecting its natural resources and enhancing the educational opportunities that are offered there. 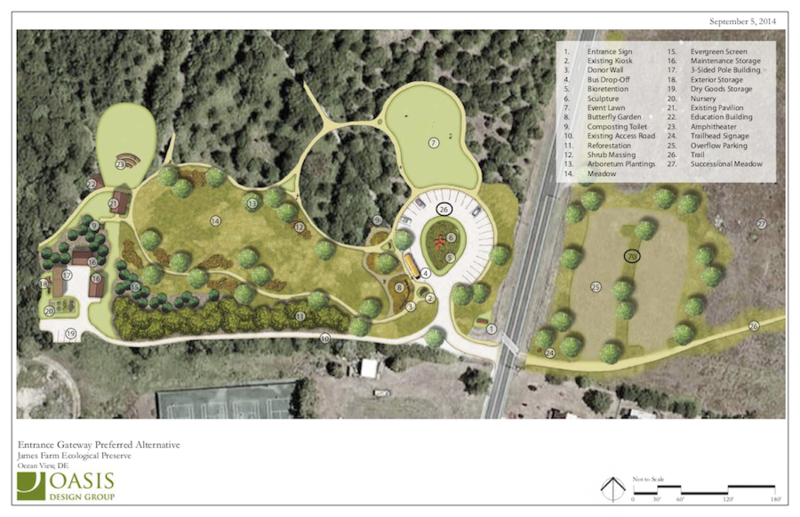 Overall upgrades to the site will include restrooms and parking, a safe entry and exit area to Cedar Neck road, storage facilities for equipment and educational programs, trail improvements, interpretive signage, and provisions for special events. November’s groundbreaking marks the very beginning of the plan’s implementation. These Phase One improvements include a new parking area that can hold 27 cars and safely accommodate the buses that bring local students for the Center’s environmental educational programs each fall and spring. A new event lawn completes Phase One: an improvement that will allow for the Center to hold community-friendly events like concerts and the annual native plant sale. View of the entrance area to be improved. Photo provided by Vickie York Realty. The James Farm Master Plan covers the next 20 years of management to preserve its special natural lands and lights the way for future generations to safely enjoy this ecological treasure. The Center is now working to raise funds for the second phase of the Plan that includes repair and realignment of the trail system, construction new educational facilities, and improvements to storage areas for the Center’s projects to restore the Inland Bays. For information about the James Farm Master Plan and how you can get involved, visit www.inlandbays.org/JamesFarm. Phase One of the Master Plan is being generously funded by Outdoor, Recreation, Parks and Trails (ORPT) Program Grants from the Land & Water Conservation Trust Fund, the Sussex County Council, Community Transportation Funds of Senator Gerald Hocker and Representative Ron Gray, a Sussex County Councilmatic Grant from Councilperson George Cole, State of Delaware Grant in Aid, Bunting and Murray Construction Corporation, and by numerous private donations from the Center’s many supporters. The Center would like to extend a huge “thank you” to these financial supporters, Sussex County Council, and to those community members who visit and support the Center and the James Farm Ecological Preserve. The James Farm Master Plan includes site planning concepts to accommodate increased visitation while protecting natural resources and enhancing the educational opportunities at the Preserve. 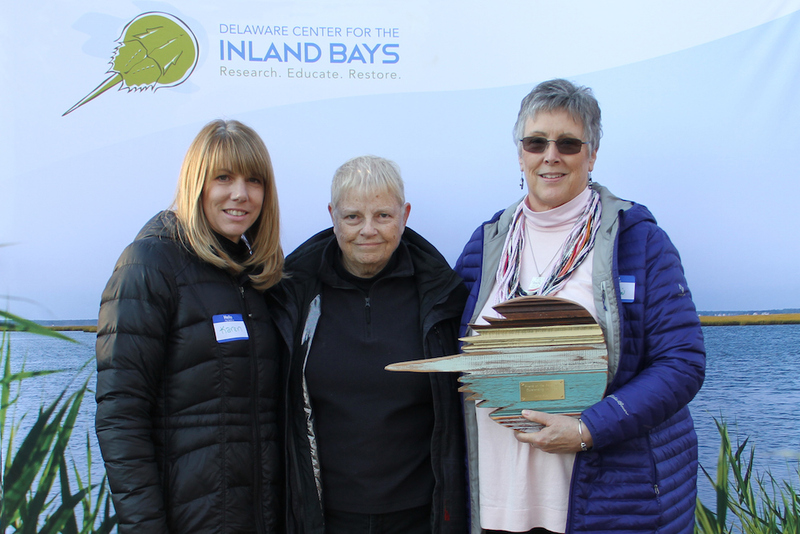 Ocean View, DE – On Friday, November 16, the Delaware Center for the Inland Bays presented three “Friend of the Bays” awards to Sussex County Council, Waste Industries, and John Austin (posthumously), for their support, partnership and volunteering excellence benefitting Delaware’s three Inland Bays. 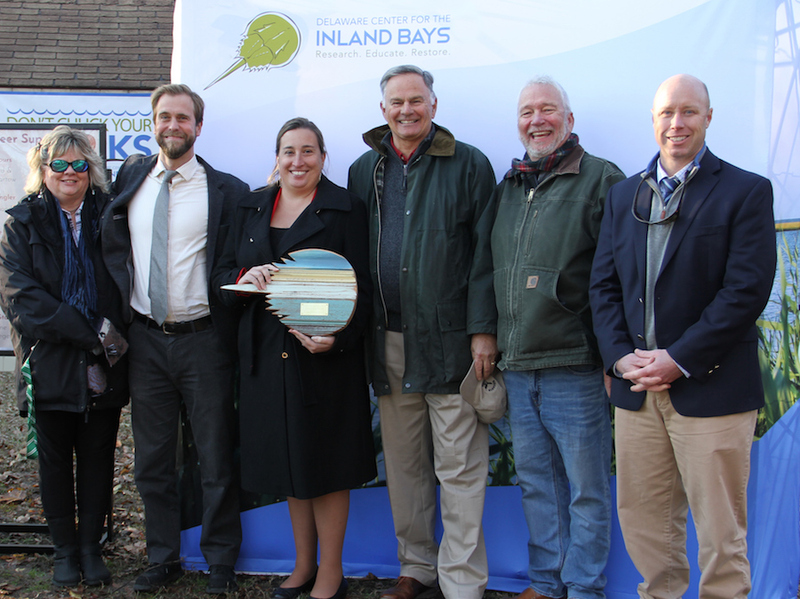 Sussex County Council was presented with the “Friend of the Bays” Partner Award for their long-term excellence in implementing the Comprehensive Conservation and Management Plan for the Inland Bays. Center Director, Chris Bason, highlighted the Council’s successful long-term initiative to provide central sewerage that converted 29,000 septic systems to sewer over a period of 30 years. “We’re very proud to be presenting this award to our partners at Sussex County Council,” Bason explained. “Their perseverance in providing wastewater treatment is integral to improving the health of our Inland Bays. The Council’s support for the James Farm Ecological Preserve each year also helps to educate the next generation of children about the importance of protecting the Bays. recipients of the “Friend of the Bays” Business Award. For several years, Waste Industries has been a generous partner of the Delaware Center for the Inland Bays. 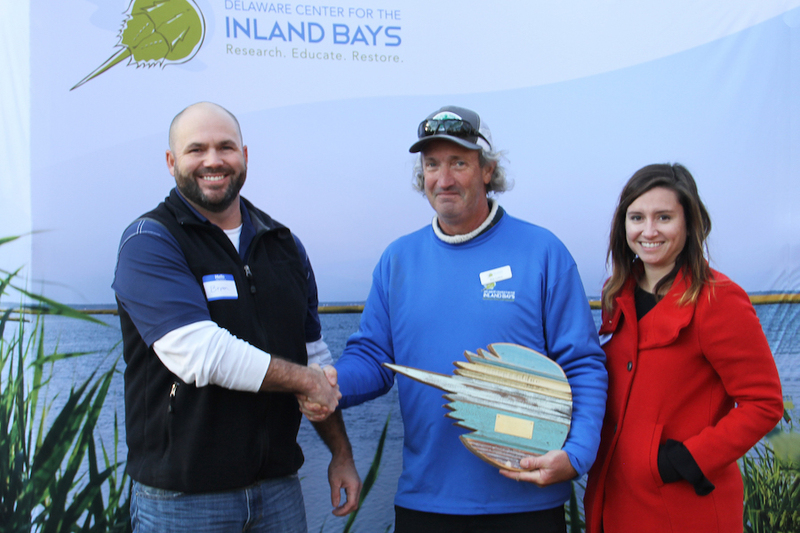 Not only have they financially supported Center projects such as the Inland Bays Cleanup, but they have consistently participated in and provided services for Center events. Upon accepting the award, Bryan Kastor told the audience that he credits outdoor experiences as a child for his passion for the Bays and for outdoor recreation. Last but certainly not least, the 2018 “Friend of the Bays” Volunteer Award was presented to Martha Austin in honor of her late husband John Austin. John was well-known in the community for his dedication to protecting Delaware’s environmental treasures. John was a fierce advocate for the Inland Bays. “John was a tireless fighter for clean water in Sussex County. His work continues.”said the Center’s Board Chair, Dr. Susie Ball. The Delaware Center for the Inland Bays is a non-profit organization established in 1994, and is one of 28 National Estuary Programs. With its many partners, the Center works to preserve, protect and restore Delaware’s Inland Bays and their watershed. Rehoboth Beach – The Delaware Center for the Inland Bays has released a series of recommendations related to wastewater permit violations at the Mountaire poultry processing facility on the Indian River. The recommendations follow a presentation in April of findings that the facility has a history of chronic permit violations and lax enforcement that contributed to pollution of ground and surface waters. The recommendations also follow the release in June of a consent decree between Mountaire and the Delaware Department of Natural Resources and Environmental Control (DNREC), which has been challenged by local residents in Delaware Superior Court. A Committee of the Center’s Board of Directors helped to develop the recommendations that include pollution remediation, regulation and permitting, environmental monitoring, and public information. While the recommendations were developed before the consent decree was released, they remain relevant today. Among the recommendations are a full accounting of pollution released from the facility in excess of its permitted limits extending back to at least 2009. Also included is a recommendation that Mountaire prevent twice that amount of pollution from entering surface waters through new pollution control practices. The consent decree between Mountaire and DNREC would require an amount of pollution twice as much as released over permitted limits to be cleaned up. However, it only seeks this beginning from July 31 of 2017, the date that a wastewater permit was issued just weeks before the facility’s wastewater system failed. The Center also recommends that the facility’s water supply wells be relocated to intercept the most polluted groundwaters for treatment by the facility’s wastewater system. The consent decree also contains this action. However, per the decree, well relocation would only be required after a new wastewater treatment system is constructed, which could take years. This will allow highly-contaminated groundwater to continue leaching from the aquifer into Swan Creek and Indian River. Other recommendations call for Mountaire to monitor the quality of water in Swan Creek and support additional monitoring of Indian River. Existing monitoring of the river during the summers of 2017 and 2018 showed some of its worst-ever recorded water quality, with extremely-dense algae blooms and dissolved oxygen levels regularly falling to near zero. An evaluation of the failure by regulatory agencies to prevent permit violations and achieve permit compliance at the facility. DNREC to maintain complete and up to date records for wastewater facilities on its public online information system. Sellers of homes with private drinking water wells to disclose the level of nitrate in the water prior to sale of the home. The Delaware Center for the Inland Bays is a non-profit organization established in 1994, and is one of 28 National Estuary Programs. With its many partners, the CIB works to preserve, protect and restore Delaware’s Inland Bays and their Watershed. 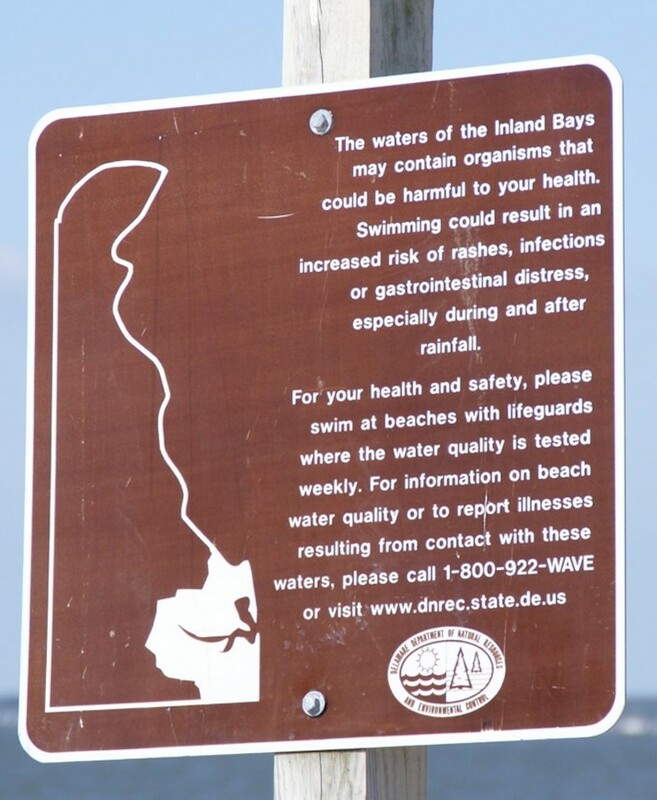 An overabundance of bacteria pollution in the Bays can cause swimmers to experience gastrointestinal issues or infection. Sussex County, DE — In Sussex County, over 29,000 septic systems have been switched to central sewerage over the last 30 years, a change that will improve the long-term health of the county’s waterways. It’s no secret that the population in Sussex County has swelled in the past decades, a change that has concentrated many new homes along sensitive waterways. Along with this influx of people comes the need to safely and adequately treat an increasing amount of waste. Onsite wastewater treatment and disposal systems, commonly called septic systems, are a large source of nutrient pollution to the Inland Bays. Conventional septic systems are only built to last between 12-20 years and many of the on-site septic systems in the Inland Bays watershed are close to or exceeding their lifespan. As these systems begin to age, the potential for failure increases and they can leach nitrogen, phosphorus — and even harmful bacteria — into the groundwater which flows the Bays. Half of the 26 monitoring stations in the Inland Bays do not meet the standard for nitrogen and phosphorus concentrations. Excess nutrients from runoff cause an overabundance of algae and murky water, which depletes oxygen killing fish and seagrass and reduces essential fish habitat. An overabundance of bacteria pollution in the Bays can cause swimmers to experience gastrointestinal issues or infection. Summer samples show that most tributary sites exceed the safe swimming standard for bacteria more than 75% of the time, demonstrating that these areas are frequently unsafe for recreation. The Delaware Center for the Inland Bays aims to reduce this problem by implementing a Pollution Control Strategy (PCS) which calls for the conversion of onsite septic systems to central sewers that are more effective at treating pollution and more reliable. Sussex County’s recently approved budget includes over $40 million dedicated to sewer improvement and expansion projects. The County will spend $21 million to upgrade 713 homes located along Herring Creek, a tributary that drains into Rehoboth Bay. In total, the County is working on upgrading 1,536 homes and has plans to upgrade an additional 373 homes. One future project will upgrade 120 homes in Joy Beach, costing approximately $5.5 million. Project partner and County Engineer, Hans Medlarz, explains: “Sussex County proudly carries forward the long-standing tradition of providing central sewer service to the region to improve the water quality of the Inland Bays .” Connecting houses to central sewer will reduce nitrogen loads to local waterways by over one million pounds per year. That’s the nitrogen-removal equivalent of 100 thousand bags of 10-10-10 fertilizer, a common source of nitrogen pollution that harms the Inland Bays. 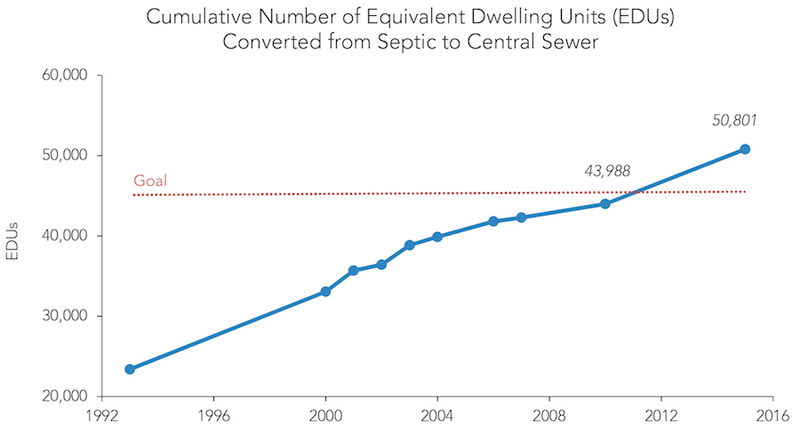 Between 2011 and 2016, the equivalent number of 6,813 single family homes were connected to central sewer, and the PCS goal for septic conversion was far surpassed. The Center would like to extend a special thank you to Sussex County, who has been integral in making these changes. The Inland Bays are a treasure to Sussex County and provide outdoor recreation opportunities, jobs, and scenic beauty. Sussex County will continue to fund projects that convert on-site septic systems to central sewer in the coming years and is currently working on six new sewer projects. Thank you, Sussex County, for helping us to protect the Bays! The Delaware Center for the Inland Bays is a non-profit organization established in 1994, one of 28 National Estuary Programs. With its many partners, the CIB works to preserve, protect and restore Delaware’s Inland Bays, the water that flows into them, and the watershed around them. 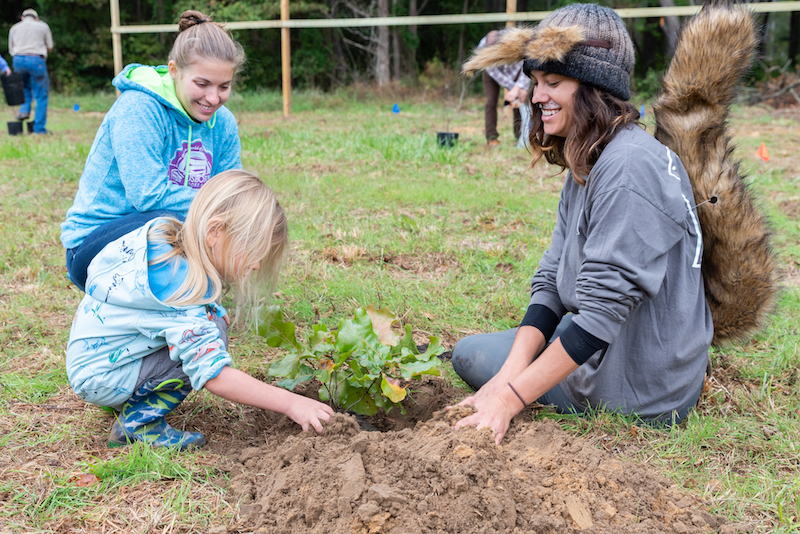 Ocean View, DE — The Delaware Center for the Inland Bays, Delaware Division of Fish & Wildlife, and volunteers came together on Saturday, October 20th to plant 325 trees at Sassafras Landing in the Assawoman Wildlife Area. 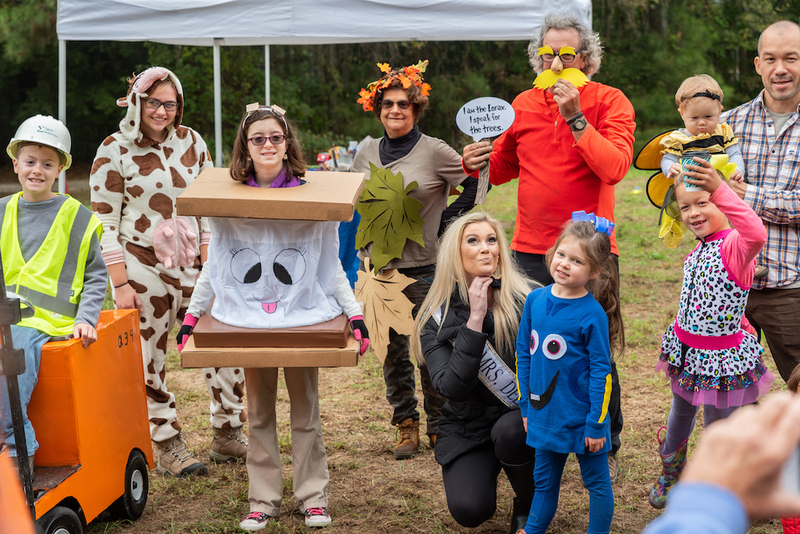 Throughout the morning, 37 volunteers of all ages planted trees, showed off their costumes, designed their own recycled bird feeders, discovered the origins of some spooky skulls, played games, and explored why forests are so important for better water quality and as wildlife habitat. Between 1992 and 2012, the Inland Bays watershed lost 14 square miles of ecologically-important forested areas. Not only does this harm the wildlife that depends on these forests (native birds, foxes, turtles, etc. ), it also negatively affects the water quality of our creeks, rivers, and Bays. Center Restoration Project Manager, Victoria Spice (right), helps Jaxon Vanderhook plant a tree as mom, Sheena, supervises. “When we replace forests with homes, roads, businesses, or parking lots, we are creating more impervious “hardened” surfaces for rainwater to pick up pollutants and wash them into our waterways,” explains Victoria Spice, the Center’s Restoration Project Manager. “But if we allow forests to grow and thrive, they can help reduce stormwater runoff and can even absorb and filter the rain, allowing it to enter our groundwater — where much of our drinking water comes from.” This reforestation project alone will reduce nitrogen by 59.5 lbs per year and phosphorus by 1.4 lbs per year, create four acres of rich interior forest habitat, and sequester 6.9 million pounds of carbon dioxide over the next 20 years. This project was a partnership between the Delaware Center for the Inland Bays and the Delaware Division of Fish & Wildlife and furthers the Center’s Inland Bays Pollution Control Strategy goal to establish forested waterway buffers in the Inland Bays watershed, the Delaware Inland Bays Comprehensive Conservation and Management Plan’s goals to provide forested buffers that reduce nutrient loading to the bays, and the 2015-2025 Delaware Wildlife Action Plan that calls for re-establishment of coastal plain forest habitats lost to fragmentation that can enhance and protect both biodiversity and water quality. Additional plantings will take place this Spring between March and April. Part of the Center’s Watershed Reforestation Plan, two additional reforestation projects we will take place on Double Bridges Road in the Assawoman Wildlife Area and within a buffer property at the Sussex County Landfill. For more information, or to get your large group involved, please contact Victoria Spice at vspice@inlandbays.org. Quinton Ashman, Bryanna Lisiewski, Sedona Ashman, Sue Sigvardson, Mrs. Delaware Earth, Bob Collins, Maeva Colona, and Avery, Addison, and Eugene Isaac pose in their costumes. The Delaware Center for the Inland Bays is a non-profit organization established in 1994 and is one of 28 National Estuary Programs. With its many partners, the CIB works to preserve, protect and restore Delaware’s Inland Bays–the water that flows into them, and the watershed around them. Lewes, DE — The public is invited to attend the next Scientific and Technical Advisory Committee (STAC) meeting on Friday, October 26, 2018, from 9:00 am – noon at the DNREC Lewes Field Facility on 901 Pilottown Road in Lewes, DE. At this meeting, the focus will be on development of mathematical models of the Inland Bays to make predictions about the results of pollution inputs. Dr. Jeremy Testa of the University of Maryland Center for Environmental Science will discuss the use of ecosystem models to explore the long-term impacts of nutrient pollution on bay water quality. Dr. Joseph Zhang of the Virginia Institute of Marine Science will present his work on a new modeling approach to study water movement and pollution problems in estuaries such as the Inland Bays. The agenda also includes input from the STAC on updates to the Center’s Comprehensive Conservation and Management Plan, and a discussion of priority research needs for the Inland Bays. STAC meetings are a great opportunity to hear presentations about the local environment, and a chance to ask questions about the latest research being conducted on the Inland Bays. This Committee provides objective advice and guidance to the Center’s Board of Directors and other cooperating agencies that have interests in Delaware’s Inland Bays. A draft agenda and additional information about the Committee and past meetings can be found on the CIB website and at www.inlandbays.org/stac. Posted in PRESS RELEASE | Comments Off on Explore Mathematical Models of the Inland Bays at this Friday’s STAC Meeting! Kids Head Outside for Hands-On Education with Help from a Green Grants Award! Ocean View, DE — The Delaware Center for the Inland Bays, with the help of a Green Grants award from the Delaware Nature Society and Delmarva Power, will bring the classroom outside for local students this fall, through the James Farm Education Program! Started in 1999 as a partnership with the Indian River School District, the James Farm Middle School Education Program offers outdoor, hands-on learning opportunities for local students. Essential funding for the Fall 2018 semester is generously provided by a “Green Grants” award from Delaware Nature Society and Delmarva Power. Grants and private donations like these are critical to the continuation and expansion of this program. Education takes place in the field. The James Farm program is an ‘extension activity’ that is aligned with the school’s science curriculum. 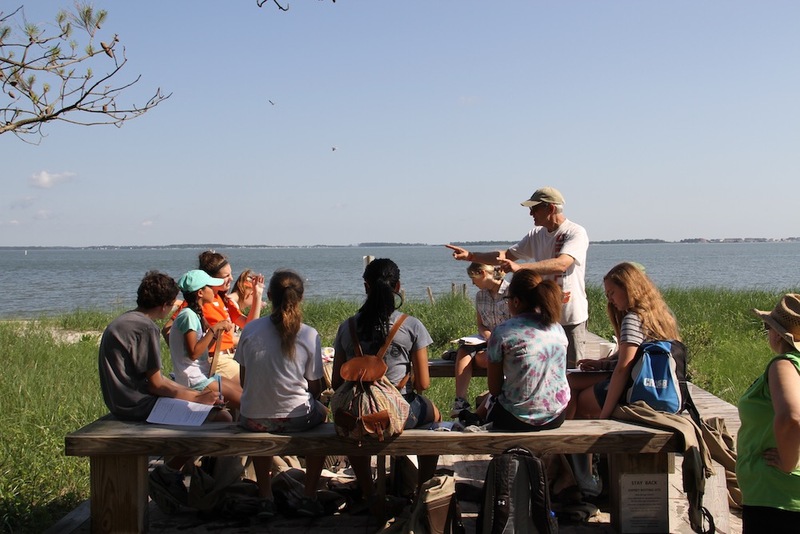 After learning concepts in the classroom, students head out to the James Farm Ecological Preserve to participate in hands-on activities, conducting many of the experiments done by professional and citizen scientists. In addition to students from Indian River School District, this fall the program is expanding to also include students from The Jefferson School, who will visit the site to learn about animals that rely on the Inland Bays habitat. Posted in PRESS RELEASE | Comments Off on Kids Head Outside for Hands-On Education with Help from a Green Grants Award!